Be the first to share your favorite memory, photo or story of Dena. This memorial page is dedicated for family, friends and future generations to celebrate the life of their loved one. 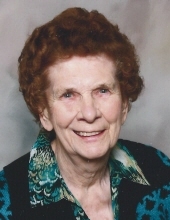 Dena E. Fishbourne, age 95, beloved mother and grandmother went home to be with the Lord on February 5, 2019 surrounded by loving family. Dena was born October 26, 1923 to Lambert and Lena Combee. She was preceded in death by her parents and four sisters Jennie Newell, Annie Keck, Mary Ann Cambell, and Leona Workman. Dena is survived by her daughter Linda (Charles) Primm and grandson Daniel Primm. Dena married Clayton Fishbourne August 15 1945. Dena accepted Christ as her Savior and Lord and she served as a faithful member at Lynden Assembly of God. Dena was very giving to others in need, riding bicycle for the Lynden Cystic Fibrosis fundraiser, caring for Audrey Chronister, or assisting friends and neighbors. She enjoyed traveling to Hawaii 11 times with various friends and relatives. She also enjoyed gardening, reading, walking, and watching various sports. Dena enjoyed living in Lynden all her life except the last five years with Chuck and Linda in Puyallup. You’re invited to share your memories and condolences in the online guestbook at www.gilliesfuneralhome.com. A celebration of Dena‘s life will be held on Saturday, February 23, at 3 PM at Gillies Funeral Home. In lieu of flowers contributions may be made to either The Lighthouse Mission, PO Box 548, Bellingham, WA 98227or Whatcom New Life Assembly Missionary Fund, 2290 Main St., Ferndale, WA 98248. Funeral arrangements are entrusted to Gillies Funeral Home and Cremation Services. To send flowers or a remembrance gift to the family of Dena Fishbourne, please visit our Tribute Store. "Email Address" would like to share the life celebration of Dena Fishbourne. Click on the "link" to go to share a favorite memory or leave a condolence message for the family.